Swathed in white, standing atop a lotus pedestal, a willow branch in one hand, a vase of pure water in the other, Bodhisattva Guan Yin is a deity of mercy and compassion. “She who observes all sounds of suffering in the world”—that is the meaning of the name Guan Yin. Bodhisattva is a title that refers to a rank of spiritual attainment that is above Arhat and below Buddha. 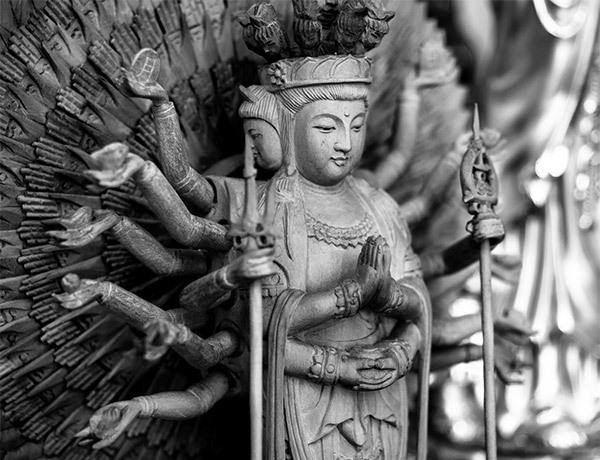 Legends about Guan Yin first appeared in the Middle Kingdom more than two thousand years ago. Her popularity exploded around the Song Dynasty (960–1279), and she continues to be hailed and worshipped as the “Goddess of Mercy” to this day. Long ago in a small Chinese state, a king had three daughters and, pursuing further worldly gain, he wanted to marry them off to suitable families. Yet his youngest, Miao Shan, had a different wish. She wanted to become a Buddhist nun and perfect herself through spiritual cultivation so that she could bring salvation to the world. Unsympathetic, the king disowned his daughter and sent her into exile. This wandering monk proved to be none other than a transformation of Miao Shan. After years of arduous spiritual practice, she had become a bodhisattva. Having heard of her father’s trouble, she morphed into the monk to advise the king. Then at the temple, she received her father’s messenger in her true form and told him, “This illness is punishment for past sins. But as his daughter, it is my filial duty to help.” She then removed her eyes and severed her arms for the messenger to take back. So the king traveled to Fragrant Mountain. There, he was shocked to see his daughter presiding over hundreds of followers, and without arms and eyes! Tears fell from his kingly eyes as he came to realize all she must have suffered. However, Miao Shan received him benevolently, and bade him to live with compassion and to practice Buddhism. Then, a flash of light engulfed them all as she transformed into the divine image of a bodhisattva with eyes and arms restored. In some versions of this legend, Guan Yin manifested with one thousand eyes and one thousand arms—all the better for reaching out to all who suffer in the world. Popular stories about Guan Yin involve her transforming into unassuming characters to bring help to troubled people. In some regions, Guan Yin is depicted carrying a wicker basket, and is revered as the patron saint of sailors and fishermen. One such legend takes place in a riverside village plagued by a gang of notorious bullies. 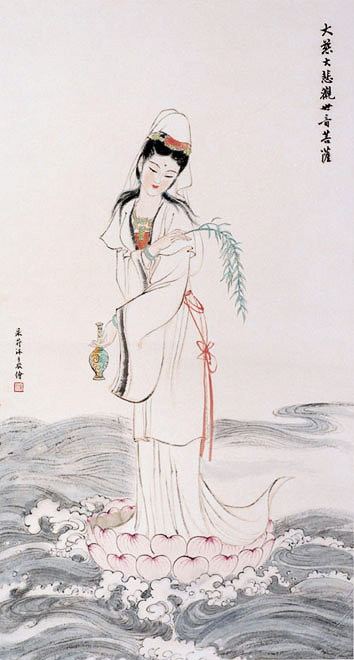 After seeing the people’s suffering, Guan Yin transforms into a beautiful young fisherwoman to pay the village a visit. The gang’s leader falls in love on sight and wishes to marry her. But Guan Yin insists he first memorize Buddhist scriptures, abstain from eating meat, and perform good deeds. As a result, the entire posse relinquishes their weapons and change their ways. Thereafter, the village became a delightful place to live, and people everywhere came to know it as a place of compassion. Guan Yin is a prominent figure in Journey to the West. One of the four classics of Chinese literature, it tells the tale of a Tang Dynasty monk’s epic pilgrimage with three colorful and magical disciples. 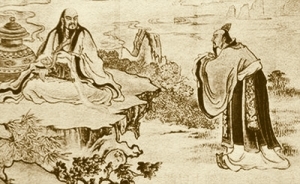 Written by Wu Cheng’en in the 16th century, the beloved adventure novel combines action, humor, and spiritual lessons. 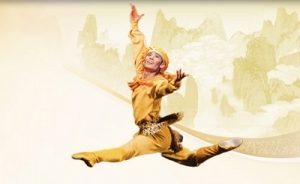 Shen Yun has presented adaptations of numerous stories from it. The classic begins when Guan Yin instructs the emperor to call for a quest to retrieve Buddhist scriptures. She then enlists Monkey King, Pigsy, and Sandy as disciples for Tang Monk. Her intention? To have them make amends for causing trouble in the heavens, protect Tang Monk from peril and, most importantly, advance on their spiritual paths. The whole way, the three disciples drive out evil and safeguard their master. However, sometimes even savvy Monkey is at a loss. 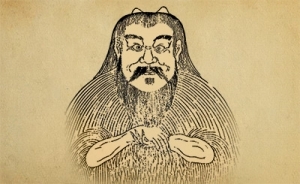 But just as he would start tearing out his fur in frustration, Guan Yin would materialize with a solution! No wonder she became so popular! This goddess of mercy can help solve any problem. But remember: she only helps those who lead a life of kindness, honesty, and mercy.